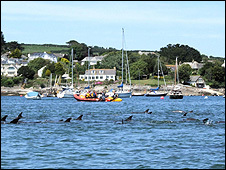 Marine experts believe there is evidence that the 26 dolphins which died near Falmouth on Monday were scared ashore. A common reason for strandings is when dolphins chase fish, but post-mortem results showed most of them had not been feeding. A British Divers Marine Life Rescue (BDMLR) spokesman said: "Very few had anything in their stomachs." If they had been feeding there would have been evidence of it, he said. "That adds weight to the theory that they were scared ashore. It is another unusual factor in this extremely unusual stranding," said spokesman Tony Woodley. Examinations had been completed on 15 dolphins and detailed test results were not expected for some weeks, he added. The dolphins were found beached around the Percuil river near Falmouth in one of the UK's worst mass strandings. The Royal Navy admitted it was carrying out training exercises with a submarine and survey ship using sonar in Falmouth Bay. But the MoD said that was "extremely unlikely" to have affected the mammals. 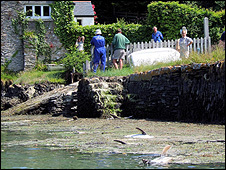 The dolphins died when they became trapped in a number of creeks around the Percuil River. It is believed there were about 76 dolphins in the area at the time and at least 40 were helped to safety in deeper waters. Some of the dead animals found on Monday are believed to have been pregnant. Two of them had to be put down. Adult dolphins eat the equivalent of 5-10% of their own body weight each day. They appear to have been well fed and there were no obvious signs of disease or poisoning, tests showed. Sonar signals from ships are among the possible causes being looked at for the dolphins becoming confused. An MoD spokesman said: "Royal Navy vessels have not used low frequency sonar anywhere in the South West areas. "A survey vessel was conducting trials using a high definition, short-range side scan sonar for sea-bed mapping trials approximately 12 nautical miles off the coast of Falmouth at the time of the incident. "It is considered extremely unlikely that this operation could have affected the mammals in any way." He said the last live munitions firings by the navy in the area were off Eddystone Light, south of Plymouth, on Friday. BDMLR chairman Alan Knight said Monday's strandings were in four separate locations and therefore he believed the animals were panicked by an underwater disturbance. "I have never heard of anything like this, certainly not in the UK and possibly not anywhere," he said. "My own personal conclusion is that there was some sort of disturbance that has caused the animals to panic." The Natural History Museum said its zoologists from the National Whale Stranding Scheme were continuing to work with vets from the Zoological Society of London to discover why the dolphins became stranded. It said marine strandings occurred for a number of reasons, including sickness, disorientation, natural mortality, extreme weather conditions or injury. Why do dolphins beach en masse?